GPS is magic. At least it seems that way. 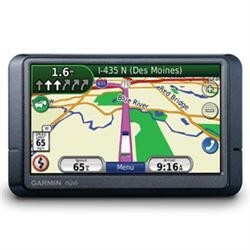 Whether you’re using a smartphone, in-car unit or standalone, GPS technology is pretty awesome. You never get lost. It always knows exactly where you are. But how does a little black box do it? The answer is the combination of basic math and some pretty cool theories. It starts with triangulation. Triangulation is part of geometry, and it was discovered thousands of years ago. If you know the lengths of two sides of a triangle, and you know the angle formed by the two sides, you can always figure out the third side. Not only that, even if you only know how much longer the one side is from the second, if you know the angle and the length of the side across from the angle, you can still figure out all the other information. This is satellite 16. The time is 12:00:00. This is satellite 16. The time is 12:00:01. This is satellite 16. The time is 12:00:02. Your GPS is really just a radio receiver. It gets as many of those messages from the different satellites as it can. It uses at least three different signals (it really needs two but the third is to help with the math.) So it gets these messages… and then what? The speed of light is the cool part of all of this. Scientists have proven that the speed of light is always the same, if the light is always traveling through the same thing. So, we can tell the distance that your GPS unit is from the different satellites… because we can tell how long it takes the different messages to get to us. They will always come at slightly different times, and believe it or not, the difference in time, multiplied by the speed of light lets us figure out the distance. It’s all coming together. Distance = length. We know the distance between the satellites and we know one more fact about basic math: if you have two points on a triangle and the length of all three sides, the third point is always in the same place. So you, the third point, are in a predictable place, and va-va-voom, there’s your GPS! There’s a little more about GPS. It generally knows where you are on a map. In the past, that was preloaded on your GPS, but now with smartphone GPS devices it just downloads as needed. Marine, automotive and avation GPS’s have backup systems as well. There’s another ancient tool that comes to the aid of modern travelers: the gyroscope. A gyroscope is a neat little toy that keeps its position in space unless you act upon it. They used to look a lot like the spinning toy you see above. Now they look like computer chips or sealed boxes. A gyroscope can be used to know if you are going up, down, left, right, forward or backward, so they can be used to determine how far away you are now, compared to where you were when you started. They aren’t as accurate as the whole system of satellites and radios but they work great indoors or out, no matter what the weather is. So, the gyroscope is often used when GPS reception fails. The modern GPS system really is amazing. It combines so much technology from several thousand years, just to make sure you know where you’re going and don’t have to stop for directions. Your new car doesn’t come with GPS. Now what.